The FRS college scholarship program awards twenty five scholarships in the amount of $2,500 to winning applicants across the nation. Eligibility requirements and the application can also be downloaded from FRS Website at www.frs.org. Completed applications must be returned to our office by February 15, 2012, so that we may complete the Sponsor Certification and forward the applications to FRS. The RIITA college scholarship program will award one $2,500 to a winning applicant receiving telecommunications services from a RIITA member (Alpine is a RIITA member) and is from a rural area. Eligibility requirements and the application can also be downloaded from the RIITA Website at www.riita.com. Completed applications must be returned to our office by March 1, 2012, so that we may sign the application and send it to RIITA. 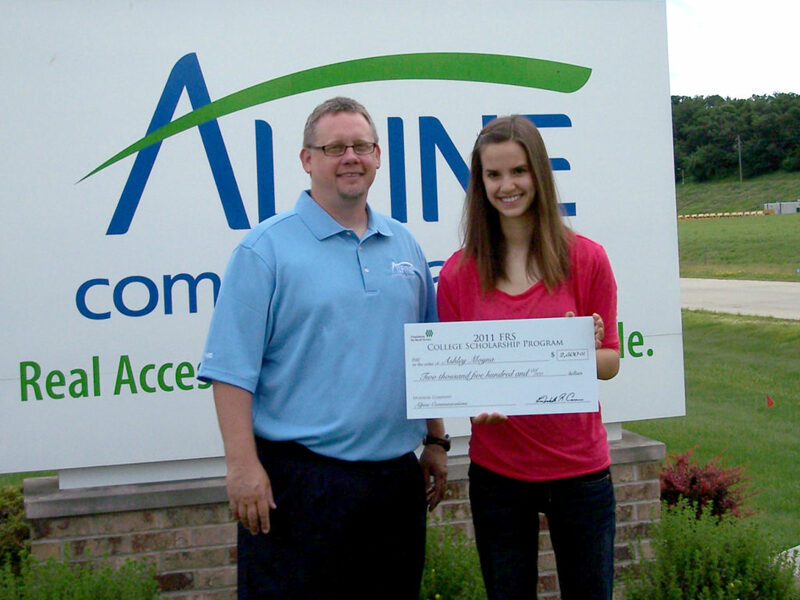 The Alpine Communications scholarship program will award four $500 scholarships to winning applicants, one graduating Senior from Central, Valley, Clayton Ridge, and MFL MarMac schools. Each school’s Dollars for Scholars program administrates the scholarship. Eligibility requirements and the application can be obtained from your guidance counselor’s office.